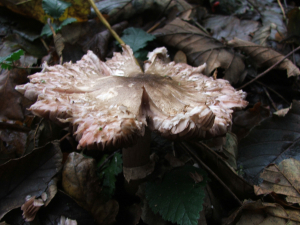 Observation - Shaggy Parasol (Macrolepiota rhacodes) - UK and Ireland. Description: there were several of these at different stages of development and decay. They were growing mainly beneath coniferous species including Yew (Taxus). there were several of these at different stages of development and decay. They were growing mainly beneath coniferous species including Yew (Taxus).